Say you have a little project for your home bubbling away in your mind. You think its an easy/simple one. All you need… is a builder to implement it. Every year, thousands of Aussies build new homes, or renovate and extend their existing homes. Unfortunately, many are unhappy with the finished result. Some owners find their home looks different to the way they pictured it, is poorly planned, hard to heat or keep cool, or has cost far more than they thought. This is where an Architect could have helped. 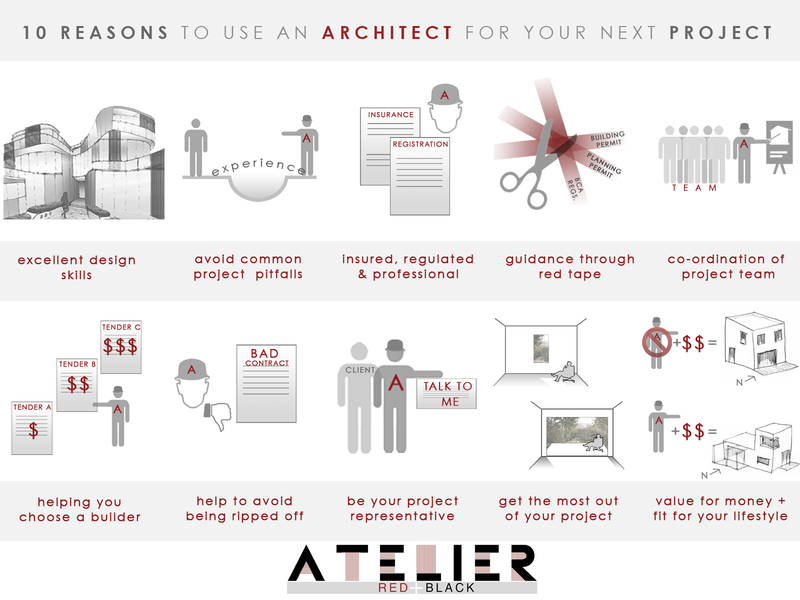 So Atelier Red+Black put on our thinking hats and have put together an info-graphic that might come in handy next time you are considering a building project of your own. If you’d like to know more in detail about the reasons listed above, you can read about them on Our Blog. And if you like what we have put together, feel free to contact us or spread the word! After all, Architecture is for everyone…..
or broadcast without the prior written permission of Atelier Red+Black. Website by Atelier Red+Black. Blog at WordPress.com. All content © Atelier Red+Black.